FFTF partners want to see improvements in floodplain health as it relates to agricultural viability, increases in fish and fish habitats, and reduced flood risk to people and property. While improvements from specific capital projects, such as levee setbacks, will be monitored at the project level, the following metrics aim to track trends at a different scale using both qualitative and quantitative means. What is the current status and condition of floodplain? Puyallup watershed floodplains are simultaneously undergoing multiple landscape and land use changes. The purpose of this metric is to observe and summarize all of these changes from a high-level and qualitative perspective. FFTF Partners will come together on a biennial basis in a State of the Floodplain Summit meeting to review results of ongoing monitoring and share first-hand knowledge to characterize the current status and condition of the floodplain. Partners will take into account the monitoring results, group knowledge, and other factors to come up with a qualitative status assessment of floodplain condition. Descriptive status categories (e.g., improving, staying the same, declining) will be discussed by FFTF Partners at the first State of the Floodplain Summit meeting as well as potential weighting factors for determining status. More information about the State of the Floodplain Summit can be found in the Monitoring Plan. What is the gross and net revenue from farming? Every 5 years, the US Department of Agriculture (USDA) the Census of Agriculture is conducted by National Agricultural Statistics Service (NASS). The most recent census was in 2012. The census includes a variety of statistics with the key parameters for this metric as: 1) Total income from farm-related sources, gross before taxes and expenses, and 2) Net cash farm income of operation. In 2012, the total market value of agricultural products sold County-wide was $90,933,000. In 2012, the total income from farm-related sources County-wide was $5,398,000. In 2012, the farm incomes (net cash) totalled $8,865,000 County-wide. The gross and net revenue of farming in Pierce County represents the viability of the farming economy in the county. Changes in these parameters will be tracked and measured against the 2012 Census as a broad indication of farming activity in the County. The 2017 Census will be released in February 2019. How many farm businesses are operating in Pierce County? Every 5 years, the US Department of Agriculture (USDA) the Census of Agriculture is conducted by National Agricultural Statistics Service (NASS). The most recent census was in 2012. The census includes a variety of statistics with the key parameters for this metric as: 1) Number of Farms, and 2) Land in Farms. In 2012, there were 1,478 farms across nearly 50,000 acres of Pierce County. 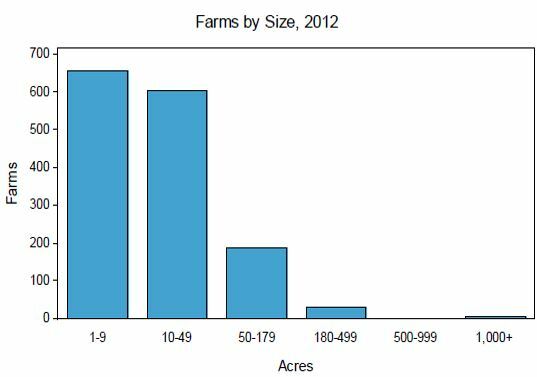 The average size of individual farm was 33 acres. This amount was slightly increased from 2007. 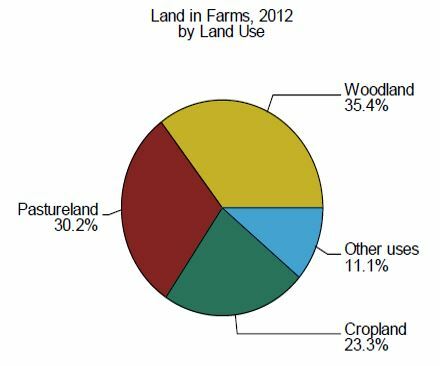 Land uses on these farms range from pasture, croplands, and woodlands. Changes in these parameters will be tracked and measured against the 2012 Census as a broad indication of farming activity in the County. The 2017 Census will be released in February 2019. How are farms in the floodplain being affected by flood events and drainage? Poor drainage conditions can represent a major risk to agricultural viability. Good drainage is essential to agriculture because most crops cannot tolerate saturated soils or standing water during the growing season. Flooded or saturated fields can cause reduced crop yield or total loss of the crop. When fields remain saturated into the spring, it can delay planting of crops. Saturated soils or standing water in the winter can prevent farmers from planting cover crops, which many farmers use to prevent soil erosion and runoff while adding nutrients to the soil. FFTF partners seek to track how floodplain projects affect drainage conditions for farms. Some projects may improve drainage conditions through addressing specific maintenance needs, infrastructure, and increasing flood storage. A biennial survey of farmers will provide an indication of how these projects actually affect drainage on farms. The first survey will be conducted in 2018. What is the financial impact of flood damage on public infrastructure? Counties and cities regularly incur costs due to both frequent or catastrophic flood events. Costs include the replacement or rebuilding of public infrastructure as well as the loss of economic productivity during and after a storm event, expenses incurred by private persons or businesses, and the costs of first responders and emergency help. The latter costs are difficult to assess and track consistently over time. For major events or disasters, municipalities apply for FEMA Disaster Relief and Emergency Assistance Funds. The amount of disaster funds will be tracked and measured against the 2018 baseline as an indication of the cost of flood damages. How much riparian habitat has been restored? Restoration projects sponsored by local, state, and tribal partners that seek to improve salmonid habitats typically include restoring riparian conditions through planting of native species and removal of invasives. Riparian plantings provide natural land cover and also reduce water temperatures by shading the stream. The amount of riparian restoration will be tracked and recorded from 2013 into the future to provide a measure of progress toward improving habitat quality for salmonids. How much estuary habitat has been restored? Less than 5% of estuary habitat remains at the head of Commencement Bay due to extensive historic dredging, filing, and other activities associated with development and urbanization. Restoration projects sponsored by local, state, and tribal partners have re-established tidal marsh and mudflats where possible with additional projects planned in the future. The amount of estuary restoration will be tracked and recorded from 2013 into the future to provide a measure of progress toward improving estuarine habitat. The Washington Department of Ecology has collected water quality data at 26 stream and river stations in the Puyallup watershed. Stations are located on the Puyallup River, Carbon River, White River, Boise Creek, South Prairie Creek, Hylebos Creek, Lake Tapps, Joe’s Creek, and Lakota Creek. The majority of these stations are considered ‘basin type’, which means they are sampled monthly over the course of one year and sometimes sampled every five years. Only one station is considered ‘long-term’, which means Ecology collects water quality data every month of every year. How are salmonids doing in the Puyallup River watershed? Additional detail for this metric is under development.